Whoever said not to judge a book by its cover has obviously never seen this one. The colors are vibrant, the reflection meaningful, and even the interior cover lovely. 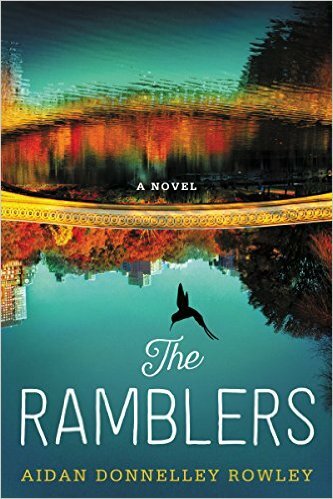 I knew I was in for a treat when I saw the cover of The Ramblers for the first time. Told through three distinct voices of Clio, an ornithologist, Smith, a professional organizer, and Tate, a photographer. Each one must come to terms with an issue in their past that's holding them back from a meaningful future. As soon as the next character was going to start narrating, I was always disappointed not to have more of the story, but I couldn't believe how quickly I was eager to take up with whoever was speaking next. Clio is worried her new relationship with an older man is moving too fast, and she panics about telling him the truth about her mother. Smith has been a puppet in her well-off family's affairs since she was young and can't seem to cut the string. Tate struggles with his wife's infidelity and if his hobby is enough to keep him happy. What I loved was how the story took place over a long holiday weekend, but it was constantly moving. Flashbacks took us back all the while these characters grew and learned lessons. As much as the book deals in relationships between the characters, their careers, and their love lives, it's also a love letter to the city of New York. The setting becomes a huge part of allowing changes to take place and the characters to confront their past and prepare for the future. This is an easy contemporary women's fiction read, but the writing is on a level above. I would love to see a follow-up with these characters again. Being in my thirties, the idea of a balance between a professional and family life really resonates with me. Fans of J. Courtney Sullivan will enjoy this too. Thanks to William Morrow for the book in exchange for an honest review. They have one copy for a lucky reader in the US. The Ramblers is part of BookSparks' "Winter is Booked" tour. US only. Giveaway ends March 13th at midnight EST. One of the most beautiful sights I have seen is the sun going down over the Rocky Mountains in Colorado. The shadows that are created are wonderful! I just love to see the buds on trees in spring. It's so exciting that new life is starting and that sense of renewal. Right now the trees are blooming and some flowers popping up around town. When I see the gorgeous sunsets during all the seasons it is amazing and spectacular. There are lots of things that are beautiful in nature. I'll go with rain since that's what we're getting now. I like the ring patterns in the water as rain or other things hits it. I like the formation of water drops on the buds in the tree. I like the dew on the leaves in the morning. I love early spring in my part of the country. The trees are still without leaves but the wild plums are blooming with their white flowers and the red bud trees are blooming with their dark pink. Driving down the road you just see random flashes of color among the bare limbs. I am not a nature girl, but one of the most beautiful things in SoCal is the Flower Fields in Carlsbad. Pretty much anything in Hawaii. Lilacs, love the sight and the smell. And thanks for once again finding a book and/or author I didn't know about! I love watching the robins build nests in our trees. i love when i see the sun come out after a rain, the way the light plays off the clouds & the colors it brings.